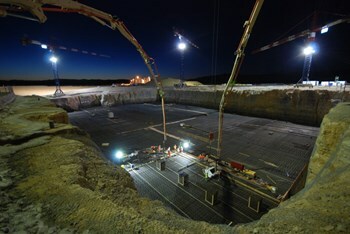 At 5:00 a.m. on Tuesday, 9 August, operations began on the Seismic Pit basemat. Concrete is a delicate material. It requires the right ingredients, the right handling and the right drying temperatures (moderate!). And so long before the Provençal sun rises over the ITER site, the giant pit at its very centre is full of activity these days. The spotlights are switched on at around 4 a.m., workers put on their hardhats, and cement mixers start their engines. From that moment, and for the next twelve hours straight, two long arms transfer their grey concrete down 17 metres into the pit below, where it slowly fills in the 1.5-metre-thick steel scaffolding that now completely covers the floor of the Tokamak Complex Seismic Pit. Guy Weissenbacher closely watches the many hands that are helping to pour, spread and smooth the concrete. Failure is not an option when you are creating the Seismic Pit basemat for the world's largest tokamak. Project director for ENGAGE, the consortium selected as Architect Engineer in charge all the construction works on the ITER platform, Guy is usually one of the first people on site these days. He has to verify that all the preparatory works have been executed correctly, that the earthing cables are in place and all safety requirements met, and that the weather report permits the start of operations. Concrete is a delicate material but its handling requires strong arms. Every day, Metéo France delivers a special forecast for the ITER construction site. "Our main interest is to know if a thunderstorm is forecasted or not," Guy reports. "If that is the case, we have to stop the works and evacuate the site." If the weather report permits, a surface area of 500 m² is poured in one go—a procedure that will be repeated 21 times over the next weeks and months to fill in the Seismic Pit basemat, which can be compared in size to a football stadium. Each pour represents approximately 800 m³ of concrete, produced in the two batching plants located on site. The Seismic Pit basemat will be the first level of reinforcement for the ITER Tokamak Complex. On top of this first level, workers are currently pouring 493 concrete plinths at regular distances: these are the 1.7-metre-high pillars that will support the anti-seismic bearings. The flexible structure of these bearings, made alternately of layers of metal and rubber, will serve as "shock absorbers" in the case of seismic motion. The basemat concrete is a special mixture that offers the durability required for nuclear installations (70 years instead of the standard 50). 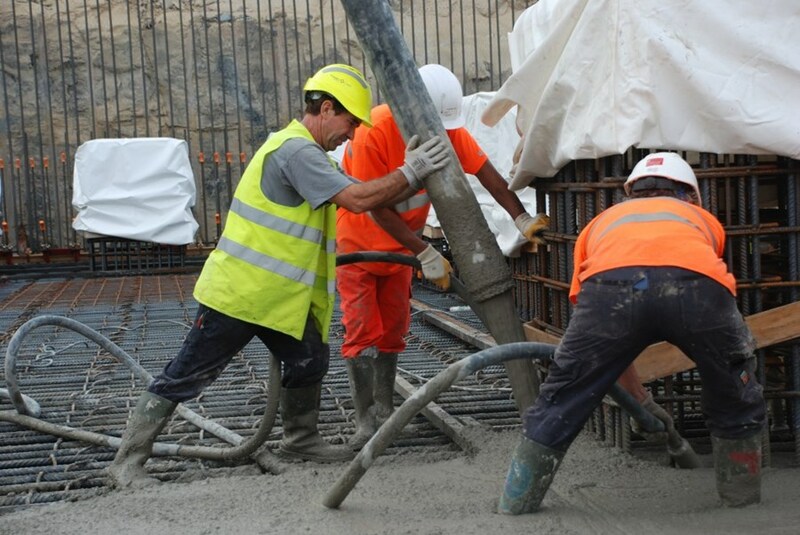 "We use only the smallest possible proportion of cement plus additives that reduce the chemical heating of the concrete as it dries," explains Thierry Lebault, project director for GTM, part of the French consortium Vinci that is in charge of the concrete works for ITER. "If the concrete becomes too hot and dries too quickly, you risk internal cracking." As we said ... concrete is a delicate material.